Synopsis, Our Opinion: A GREAT wine that is way under-valued. Producer/Winery: Andreas Berger; Thurnhof; Bolzano, Italy. 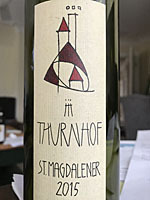 Grape Variety: Blend – 90% Vernatschand 10% Lagrein. Geographic Appellation: Alto Adige, Italy. Paired With: Grilled chicken and polenta with mild Italian sausage sauce, garden salad with romaine, tomatoes and onions dressed with artisan oil and blackberry balsamic vinegar. Opened 45-minutes before drinking. Clear as an Alto Adige mountain stream, brownish/ruby red color with a light brown rim. Light red berry aromas with hints of lavender in full bloom. Smooth, slightly tart entry and a light body. Ripe strawberry and watermelon flavors, just enough fresh acidity to make it refreshing, very smooth tannins and a long dry finish. There was an unusual dusty smokiness as the wine was swallowed. This was a SPECIAL Italian wine that paired PERFECTLY with our Italian dinner. Vicky called it OUTSTANDING with the sausage & polenta and kept going back for more just to enjoy the wonderful wine pairing!!! This was a GREAT wine that is way under-valued. It’s a wine that’s worth some extra effort to find and pair with traditional Italian food. In fact I’ll stretch our price limit and say it’s a Quality wine at a Bargain price. It was a very special week-night wine!!! 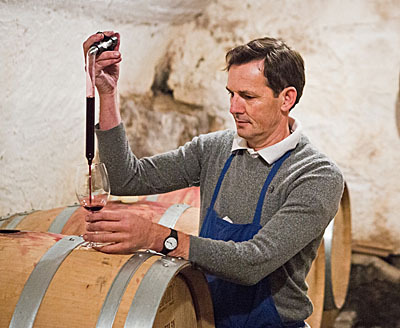 Comments: Learn more about Andreas Berger and the Thurnhof wines. Imported by: Piedmont Wine Imports; Durham, North Carolina.